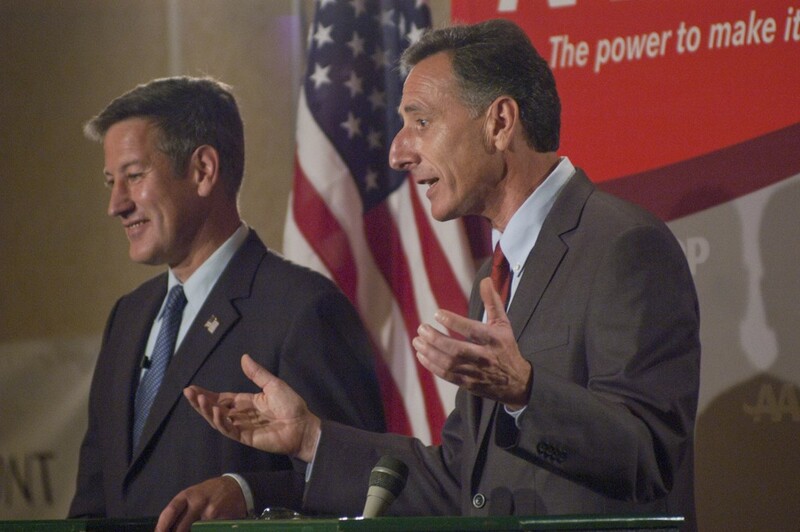 Republican Brian Dubie (left) and Democrat Peter Shumlin face off in 2010. The Republican Governors Association has agreed to pay the state of Vermont a $40,000 penalty for violating the state’s campaign finance law during the 2010 governor’s race. The RGA and the Office of the Attorney General reached a settlement to resolve a four-year-old case. The state had alleged that when the RGA ran political ads in favor of Republican candidate Brian Dubie, the organization failed to register as a political action committee and to file campaign finance reports, and also accepted contributions that exceeded the $2,000 limit. Dubie lost a close race to Democrat Peter Shumlin. Shumlin has twice since then won reelection. The RGA also agreed to file amended campaign finance reports within 30 days, and will detail contributions from two people in particular – Skip Vallee and Rich Tarrant. Attorney General Bill Sorrell said in a statement that the case sends a message about campaign finance law. “It is essential that PACs make the disclosures required under the law. The public should know who is funding the activities of the PACs that seek to influence Vermont voters,” he said. This is the second settlement between his office and the RGA in the 2010 governor’s race. In 2013, the RGA agreed to pay $30,000 in a case in which Dubie also agreed to pay $20,000. They were accused of violating state campaign finance law by sharing RGA polling data without declaring it as a contribution to Dubie’s campaign.